A great pillow can make or break your sleep experience. Even the best nights’ sleep can be ruined by a pillow that is not a correct fit for your body or well-suited to your sleeping preferences. A good pillow can help prevent snoring, stop or reduce neck and back pain, and increase comfort. Most sleep experts agree a pillow is one of the best investments you can make in terms of improving the quality and quantity of your sleep per night. With the above in mind, it was with great interest that I tested the Nectar Pillow. The Nectar pillow is a next-generation memory foam pillow with an innovative premise: one size doesn’t fit all. Memory foam mattresses are consistently ranked higher than innerspring mattresses regarding comfort and reduction of back pain, so it makes sense this material would be comfortable and ergonomic in a pillow as well. However, people have different needs in terms of pillow size and thickness. This is dependent on their body habitus and sleeping position, among other factors. The Nectar pillow is specially designed to be adjustable in overall volume and height while retaining a memory foam material construction. The pillow is made with three types of visco-elastic memory foam which allows it to contour to your sleeping position because it remembers you. It doesn’t sag and offers more support than other memory foam products. The Dunlop latex supports your neck and spine, and the up foam helps to keep you aligned. The Nectar Pillow also uses Tencel fabric in its outer casing. Tencel is a unique fabric that is softer and more breathable than standard cotton, adding to the comfort of the pillow. It is also one of the most environmentally friendly materials on the market today. This fabric is comfortable against the skin and prevents your face and neck from getting too hot in the night as well because it promotes air circulation and is naturally heat wicking. Simply unzip and toss in the washer to clean. What Makes This Pillow Unique from Other Pillows? The Nectar pillow features a cutting-edge adjustable design. Inside the inner pocket of the pillow are pieces of memory foam in various sizes. You can see this in the photo below. 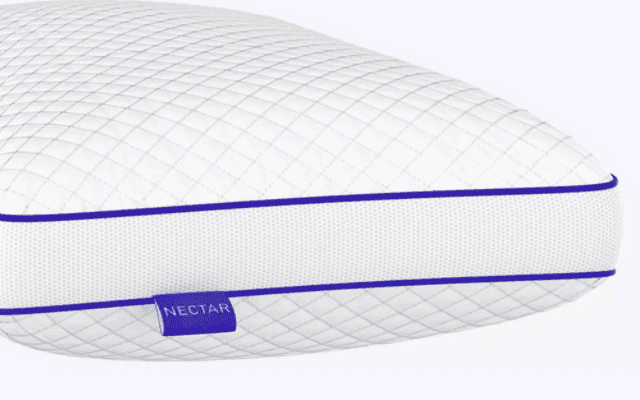 The Nectar pillow allows you to customize size by adding or removing memory foam. 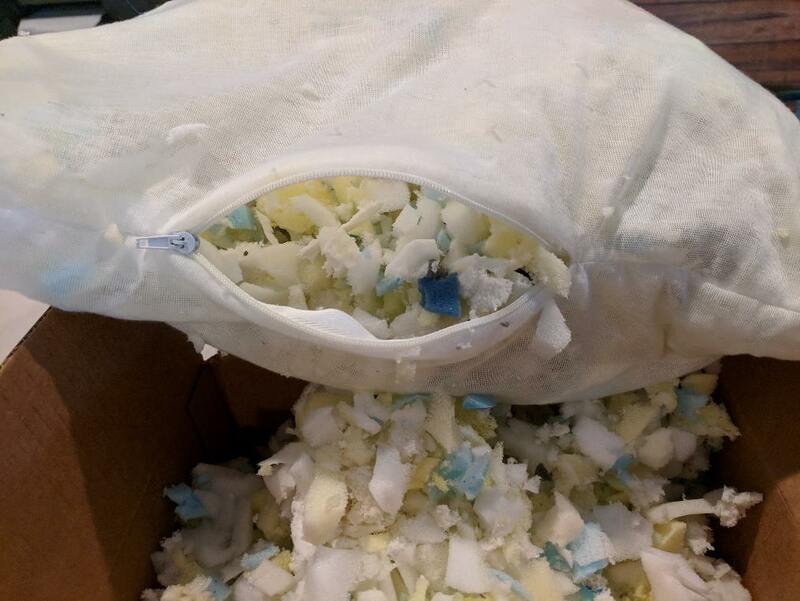 When you open the inside pocket of the pillow you can clearly see the pieces of foam inside. The foam could be easily removed or added for optimum comfort, and then adjusted accordingly. This pillow typically sells for around $75. View Nectar Pillow and Mattress Discounts Here. This price represents an excellent value for the quality and design of pillow you receive. It is worth as much as a $140 memory foam pillow because of the adjustability, as many memory foam pillows sell for this price or much more. With traditional pillow designs, you could easily buy a $140 pillow and then not like it due to thickness or firmness after sleeping on it for a night or two. With Nectar, however, this situation is not possible. You just add or remove foam to adjust the pillow to how you like it. Nectar Sleep is an innovative company within the sleep industry. It is known for producing excellent quality memory foam mattresses and pillows, as well as sheets and bed foundations. Reviews of Nectar Sleep products are overwhelmingly positive and note the very high quality and comfort of the products offered and at a much more reasonable price point than Tempurpedic or other major brands. As one example of the high quality of products that Nectar offers, the mattresses come with a lifetime warranty and 365-day in-home trial period. This pillow was delivered quickly and arrived quicker than I expected. On first sight, I thought this pillow looked too thick for me. Though higher-end pillows seem to lean towards thickness, like the Sleep Number memory foam pillows, I was still quite concerned, since I don’t usually prefer thick pillows because I normally sleep on my back. My wife Susan and I had guests over the first night of our pillow trial, so my sister-in-law decided to try this pillow first. She slept on it for two nights. Overall, she liked the pillow. It was cool and comfortable, but it was too thick for her at first, and her neck was at a steep angle that was a bit uncomfortable for her. Of course, I had forgotten to remind her the chunks of memory foam inside could be removed for adjustability to increase comfort. We opened it up to see what was inside and to adjust it. Some pillows, such as the Eight pillow, have layers in them and they can be adjusted to various heights. The Nectar does not have layers, but it does have an inner pocket with a zipper that contains the foam pieces. I dumped about 30% of the foam out into a cardboard box. After adjusting the size to a thinner form, my sister-in-law loved the pillow and wanted to sleep on it more. It was a struggle to get her to give it back to me, so I could test it at last! I added some more foam back to the Nectar pillow before sleeping on it. I like a little more volume in a pillow than my sister-in-law does, while still preferring a medium pillow height. That night was probably the best sleep I have had in recent memory. When I woke up, I felt relaxed, refreshed, and ready to start the day. Unlike with so many other memory foam style pillows, my head did not get too warm in the night, and nor did I have any pain or discomfort in my upper back or neck. My head felt very supported throughout the night, without feeling like I was sleeping on something too firm or stiff. My wife slept on the pillow for a night and had a similarly positive opinion of it. She took a little more foam out as she sleeps on her side but likes a thinner pillow. She slept very well using the Nectar and like me had a comfortable and painless sleep all night long without waking up. My brother added some memory foam in and considered this to be a relatively good pillow for the price. I have to say this is a great concept in a pillow. I am a little surprised that no one thought of it before. It’s so simple but perfect. I would say 99% of buyers are going to be happy with this pillow because of the absolute customization that is possible. Overall, this is my #1 pick of a memory foam pillow. Purchase the Nectar Pillow Here. Or, Read On for more pillow reviews like the Layla Pillow.